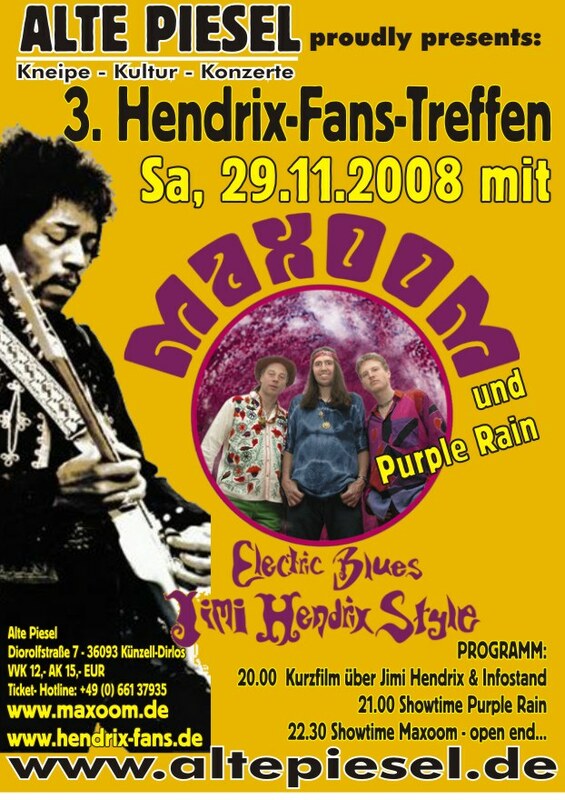 Das deutsche JIMI HENDRIX-FAN Meeting am 29.November 2008 ! 1. ''Maxoom'' was founded in spring 2001 by Bernhard Justus (guit/voc), Sven (Lucky) Luke (dr) and Love Persson (bass). They perform Electric Blues, a stronger form of straight Blues. The repatoire consists of own songs and of songs by the great bands of the Electric Blues aera of the late 60ies, such as Cream, Mountain and the Jimi Hendrix Experience, but these covered songs deliver mostly only the framework for own improvisations. 2. '' Purple Rain ''...the pretty cool german band for support. 4. ....and a big information-desk about the last (''old''and new) hendrix-publications... cds, books, a.s.o. 5. .....short Hendrix film at 8 p.m.
6. Good food and drinks at the club "Alte Piesel"
4 .Other Hotels, booking www.hrs.de destination Fulda or Künzell. Very good and cheap accommodation at Bachmühle 0661-93790 and Rhönblick 0661-63654 !